There are just so many awesome things going for 'Namak Halal' that it boggles the mind, much like the movie will do to the senses. It is one of the true classics in the genre of masala (or Bollyweed) movies and one of my favorite movies of all time. What makes this movie so great is that it is not just as good as the sum of it's parts - it's better. As usual the plot is secondary to the awesomeness of this movie (and most masala movies in general as far as I am concerned) and it's a great watch for any lover of Bollywood so buy it or rent it without delay. So what exactly does this movie have that makes it so awesome? Well first and foremost it's a Shashitabh starrer and any movie with my two favorite actors is worth it's weight in gold (especially smuggler's gold but that's a discussion for another day). They play off each other amazingly well whether it be a serious movie (Deewaar) or a comedy such as this one. Again, on their own they have given the world of Bollywood some amazing movies but together their contribution just goes to another level. The movie boasts one of the true legends of India's art house scene in one of her few mainstream movies. Smita Patil was only 29 when she passed away from complications due to childbirth but left behind a legacy of classic films and memorable performances. Many actresses of today's generation including Nandita Das and Tabu credit her as a major influence for their careers. She elevated any movie she was in and this was one of the few masala movies she starred in. The movie also stars one of my two favorite Bollywood actresses of all time (the other being Madhubala) - Parveen Babi. Parveen is a fellow Guju and was discovered while she was watching a shooting of a film in the city of my birth, Ahmedabad. She was never known as a particularly great actress and had little formal training in it. But she was just a joy to watch on screen (for me at least) and not just for her beautiful looks but because she was such a natural in whatever role she took on. She was known in the industry for her kindness and generosity which makes the mental illness that afflicted her in her later years even more tragic. The above scene was one of the movie's many comedic gems. Amitabh's character (Arjun Singh) is a simple boy from the country and wants desperately to impress a potential employer with his knowledge of English. People were quoting this scene for months after the movie came out and I think it still holds up rather well. 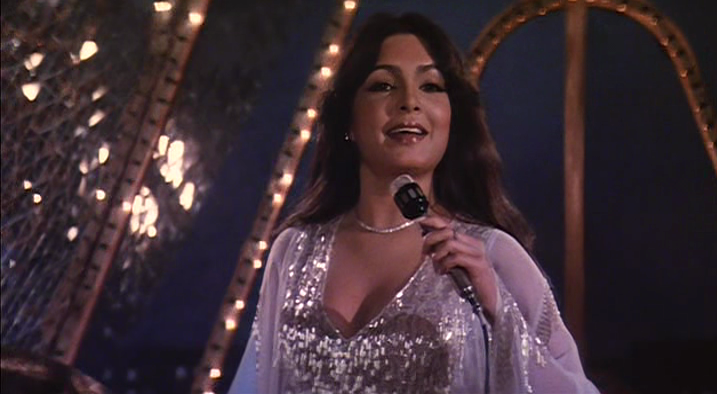 The above song was one of the biggest hits of the movie and also was the Filmfare Award winner for best song for 1982 (Amitabh was nominated for his performance but didn't win). It was one of Bappi Lahiri's most complex and memorable compositions as he took a bhajan (Indian devotional song) and turned it into a hit pop song. In fact, the middle of the song actually showcases his singing as the fast tempo of the Hindi version of 'Do Re Mi aka Sa Re Ga' was too intricate for Kishore to handle. Nonetheless, it was great visually and musically as no one had really attempted to do this in Bollywood until this song came along. But the song for the day is definitely the stand out tune in the movie, Aaj Rapat Jaye by Kishore Kumar & Asha Bhonsle. Not only is it an amazing duet on it's own merits but it is one of the best 'rain' songs ever to be depicted on the silver screen. Sensual without being dirty and cute without being cliche. Smita Patil and Amitji both bring it for this song and it remains a true classic to this day. I LOVE LOVE LOVE this movie and all the songs, but even though "Thodisi Jo Peeli Hai" is my favorite in this movie, Aaj Rapat Jaayen has a special quality about it. Have you seen the Peter Sellers movie "The Party"? It's hilarious and was rumored to be the source of the shoe falling in the fountain scene. But the addition of the drunk that insisted Arjun Singh was "his best friend" was one of my favorite. Also the "makhee" scene with the fly is a classic! 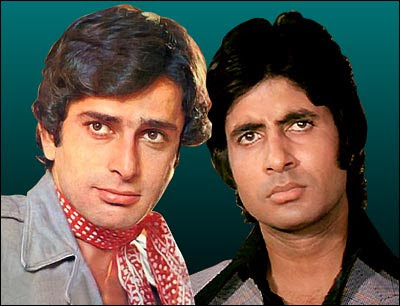 Amitabh was tremendous in this movie! Amaluu - when the movie/soundtrack first came out 'Thodisi Jo Peeli Hai' was my favorite too and it's fair to say this whole soundtrack is just fantastic. And I love 'The Party'! and can totally see how the shoe in the fountain scene was the inspiration for Amitji's antics. I haven't seen the movie, but after reading this piece, itching! 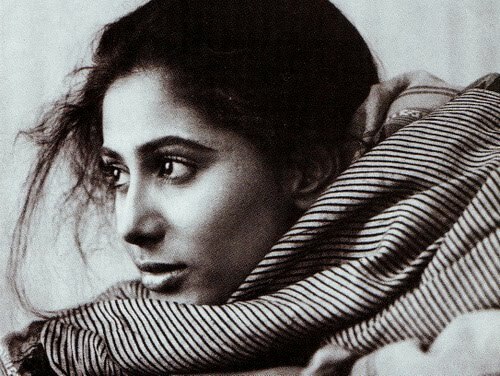 My father is a Smita Patil fan (I think no man of the previous generation was left untouched by her sensuality). Of the movies I have seen, I would rate Rim Jhim Rim Jhim from 1942-ALS (aaaahh, Manisha...so beautiful)...and Lata's version of Rim Jhim Gire Saawan from Manzil as some of the most delectable combinations of music, picturization and lead actors in a rain song. WP - heartily agree and it wasn't just her sensuality that made her such a brilliant actress. Her less glamorous roles in 'Aakrosh' & 'Chakra' were so heart wrenching that other actresses of any generation simply can't compare. The song from 'Manzil' is a great one and I love Kishore's rendering of the song as well. I am with Amaluu....love, love, love this movie and songs. And thanks for visiting my blog Sankeet. Added you to my list too and do check out my response to your comment. Cheers.